The Canadian Rockies are a nature lover's dream come true. The numerous ranges that comprise the Rocky Mountains span the length of two countries. Starting in Northern Alaska, the Rockies wind through the Canadian pacific region, widen out a bit in the northwestern United States and finally taper off in northern New Mexico. To say that the Canadian portion of the Rocky Mountains is known for its beauty would be a gross understatement. The pictures seen so often of snowcapped peaks reflected in pristine mountain rivers simply cannot do the region justices. Dense forests, still unspoiled by the effects of urban sprawl, still abound in western Canada. This makes the area an unforgettable vacation destination. But the purity of the Canadian Rockies makes for more than just a picturesque tourist attraction. There is an abundance of wildlife that thrives in this area's Edenesque landscape. What's more, many of these species are vanishing everywhere else in the northern hemisphere. Among the regions wildlife are large mammals (like bison, mountain goats and caribou) golden eagles, beavers porcupines and much more. The Pacific ocean is just a day's trip away from the western side of the Canadian Rockies. Those willing to make the trip to British Columbia's shores may be lucky enough to see some rare, aquatic life in the forms of orcas, gray whales and Pacific White-Sided Dolphins. It's not surprising that the animals that inhabit this virtually untouched paradise experience very few survival issues. Salmon have crystal clear stream and rivers in which to swim, which in turn leads to adequate amounts of food for grizzly bears. There is plenty of green grass for the Rocky Mountains' moose population and fresh roots for the various rodent species. If you love viewing wildlife in its natural habitat, there is no better place to visit than the Canadian Rockies. Let Fresh Tracks help you plan the perfect Canada vacation for you and your family. Whether you want to roll through the Rocky Mountains on a relaxing train trip, get an overhead view from a biplane or hike on guided tours, we have your solution. 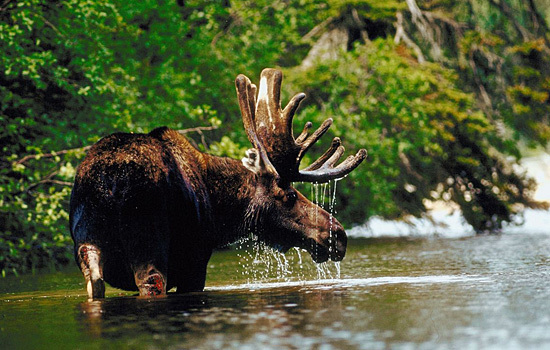 Need more information on Wildlife Tours in Canada? Talk to one of our Canadian travel Insiders who'd be happy to answer all your questions.